This is the demo version of BigDeals, designed to check if the indicator works on your financial instruments and to evaluate its features. In the demo version, the real trades are replaced by random ones both in type and volume. Full version is available here. 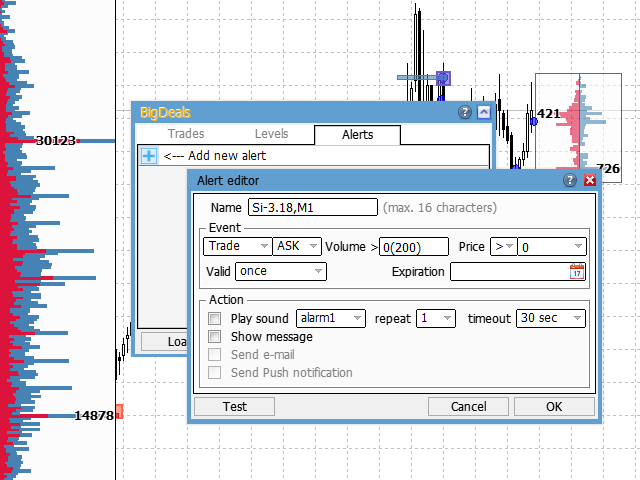 The BigDeals indicator displays large trades, chains of trades of the same type and important levels with large volumes traded over a certain period on the chart. 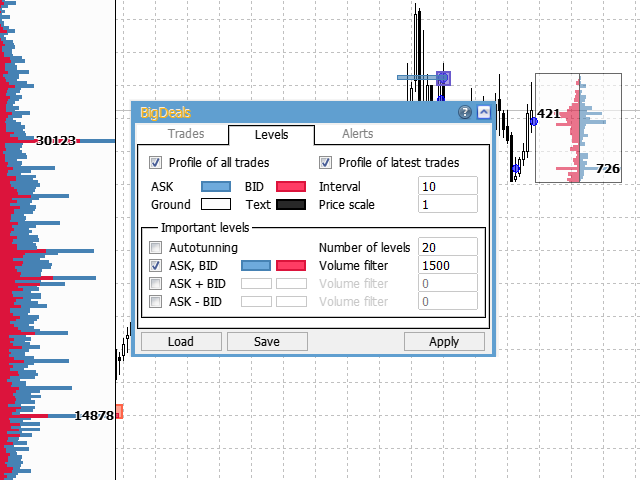 In addition, the indicator can show the profile of all trades and the profile of the latest deals. The indicator features a flexible system of signals, with the ability to send notifications to a mobile device. The instrument works only on instruments with real (exchange) volumes. BigDeals has an intuitive control panel with tooltips on the parameters. The tooltips are enabled using the "?" button, an explanation to the parameter appears when it is hovered. The panel contains three tabs: Trades, Levels and Alerts. enable/disable the display on the chart. set the number of the displayed objects; the more objects are displayed, the more resources are consumed. When a new object appears on the chart, the "oldest" object is removed. 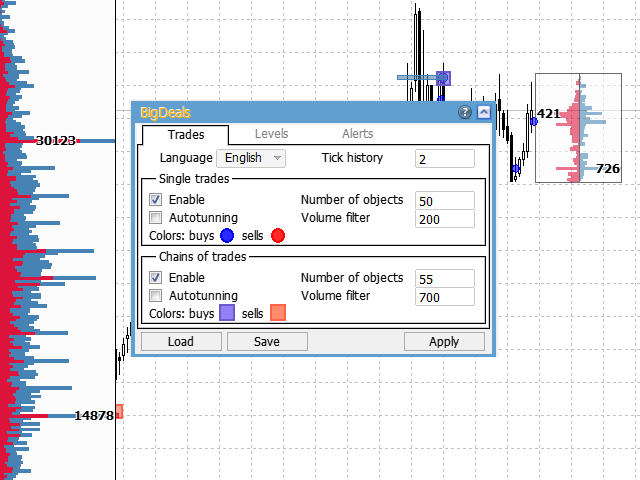 set the filter of volumes; trades/chains of trades with large volumes will be displayed on the chart. set the color of objects. enable/disable automatic filter setting mode. The filter is calculated so that the specified number of objects is evenly distributed throughout the entire depth of the downloaded tick history. enable/disable displaying the profile of all trades. This profile shows the sum of volumes of all trades on the entire depth of the downloaded history on a specific price level. enable/disable displaying the profile of the latest trades. This profile shows the sums of volumes of the latest trades for a certain time interval on a specific price level. set the time interval. 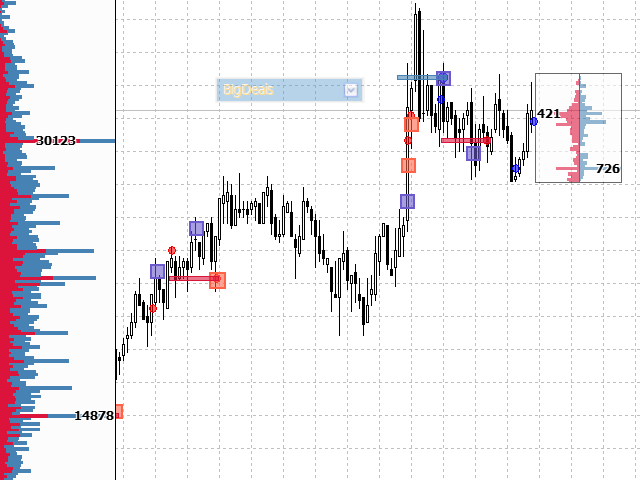 This parameter sets the interval for calculating the profile of the latest trades and price levels. set the price scale. The parameter is set a multiple of the price step for profiles and price levels. set the color of profiles. levels where the absolute value of the difference between ASK and BID volumes for a certain interval exceeds the filter value. set the volume filters for each type of levels. set the number of the displayed levels. This parameter defines the maximum number of the displayed levels for each type. When a new level appears, the "oldest" level is deleted. set colors for each type of levels. enable/disable automatic filter setting mode. The filters are calculated so that the specified number of levels is evenly distributed throughout the entire depth of the downloaded tick history. The "Alerts" tab allows you to set an unlimited number of signals. Push notification to mobile device. The alert editor has a context-sensitive tooltip, activated by the "?" Button. Added API for user programs. API allows you to access indicator events and set new filter values. API is implemented as class. API class and example of its use can be obtained in MetaEditor in the section "Public Projects". Project name - "API_for_BigDeals". BigDeals DEMO compiled under the new version of the terminal(build 1940). - Fixed a bug in the signals interface. - Fixed an error in saving settings to a file. - inaccuracy in the signal editor interface.